Below is a webinar with the latest updates on the $4.69 billion BART Phase II project. 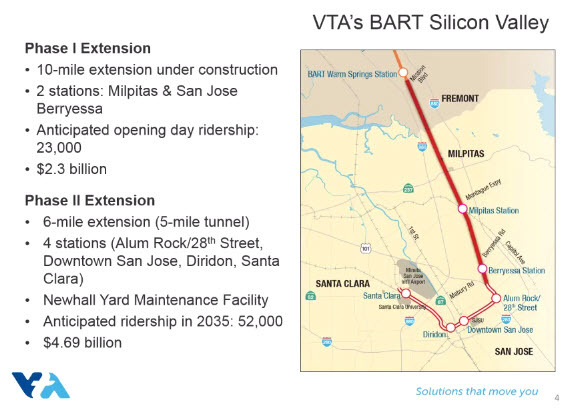 This will be the most expensive transit project in Silicon Valley history and add a subway through Downtown San Jose with three stations along with a new terminus station in Santa Clara. The video is 40 minutes long, but well worth watching if you are interested in transportation projects. One question that came up multiple times is why the heck we are building a completely redundant station in Santa Clara that is already serviced by Caltrain instead of evaluating running BART to San Jose International or Santana Row. Unfortunately, the response was very mediocre--it takes a long time to plan these projects and voters already voted for this specific alignment. I have to say that is a disappointing answer and is completely misaligned with the pace of change in Silicon Valley. It will be 9 years (at least) until this project is completed, so we should make sure we build that most effective system that will maximize utilization instead of making multi-billion dollar errors because we did the easy thing instead of the right thing. BART itself is built on 45 year old technology. I have been a huge advocate and supporter, but honestly am starting to have doubts that BART will be the most effective transportation solution in 2026. Self-driving cars will completely change the transportation landscape within a decade, and costs will come dangerously close to public transit for point-to-point transportation in a private cabin. I hope that VTA is agile enough to keep up with transit innovations and make sure we are building these epic projects for the future and not for the past. In general, BART will be a good investment for future transportation. Self-driving vehicles may seem like a game-changer, but really for whom? It's all about geometry, and as more and more people move into the South Bay, I don't foresee any significant road expansions that will accommodate the more cars on the road. Those vehicles will optimize traffic a certain percentage, but again, you can only fit so many people on the road at a certain time. Trains, however, are still the most efficient in moving people per hr along a route and so will be more of a solution than self-driving cars. It is, however, a shame that we don't have it go to the airport. But I'm not sure how keen SJC is with having BART go to it. They didn't want VTA light rail, as they make money off of parking. It's still possible to have the light rail go to the terminals, and I think that's a cheaper option (or even have your self-driving vehicles do a loop between BART/light rail/terminals!). Thanks! Think I fixed the issue and also added the link. Great information Josh. I agree with you that the traditional forms of public transit could be significantly disrupted by technology. Uber/Lyft have already started cutting into BART and Caltrain ridership. Public transit will have a tougher time competing in the coming years. The ride share and other future services move people to multiple points faster/cheaper/cleaner/safer. The reason BART is terminating at the Santa Clara station is because there is adequate space for train storage (for peak times) and a maintenance facility. There is plenty of room for train storage and a maintenance facility at the Permanente quarry. In the meantime there is no reason whatsoever why Diridon could not start operating like Fremont has in the last 20 years and save $1.5B in the process.